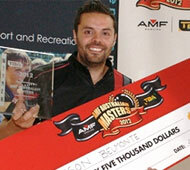 27th October, Sydney: Jason Belmonte of Australia defeated PBA Player of the Year, Sean Rash of USA to win the PBA-WBT AMF Australian Masters 2012 and his fifth PBA title while Diandra Asbaty claimed the Women's crown. It was a nervy start for both the title contenders when Belmonte edged Rash, 174-172 to take the first game in the best-of-3 championship match. The American PBA pro settled down quicker to draw level with a 255-223 win in the second game to force a third decider. But it was the two-handed Aussie who rose to the ocassion with a narrow win over Rash, 256-243 to win the Men's title. Belmonte, who pocketed AUS$25,000 (approx. US$25,870) was also awarded a PBA international title. The champion ousted compatriot, Christian Purdue 221-181, 238-235 in the all-Aussie semi-finals while Rash had to go three games to beat Chris Castle of Australia, 256-247, 175-212, 259-170 to earn a spot in the finals. Belmonte had earlier sailed past another compatriot and 2003 World Championships Masters gold medalist, Michael Little 202-154, 243-178 in Round 4 finals to advance to the semi. Rash advanced to the semi by beating Hong Kong's Eric Tseng, 191-180, 244-278, 244-203. Rash settled for AUS$12,500 for finishing second while the semi-finals losers, Castle and Purdue earned AUS$5,000 each for finishing third and fourth positions respectively. Although Belmonte's victory earned the Aussie 50 World Bowling Tour points, he failed to make the top 3 cut for the grand finals in fifth position with 239, behind Rash who remained in fourth spot with 324 points. Mika Koivuniemi of Finland, Americans Mike Fagan and Chris Barnes finished in the top 3 to sealed their places in the grand finals. Meanwhile, Diandra Asbaty defeated compatriot, Missy Parkin, 204-200, 221-192 in an all-American finals to win the Women's crown. Asbaty breezed through the semi-finals with victory over Australia's Ann-Maree Putney, 235-201, 248-222. Parkin also had an easy passage into the finals by defeating Australia's Kate Pilkington, 222-185, 220-207 in the other semi-final match. Parkin also needed only 2 games to beat Singapore's Kristel Oh, 254-158, 220-171 in the earlier Round 4 finals. Asbaty had to work harder though when she was forced into the deciding third match by Australia's Caro Gianotti but the American prevail with a 244-221 third game win to advance into the semi. The champion pocketed AUS$15,000 (approx. US$15,520) while Parkin settled for AUS$7,500. Pilkington and Putney took home AUS$3,000 each for finishing third and fourth positions respectively. Asbaty missed the top 3 cut for the grand finals by finihing fifth with 251 WBT ranking points for the victory. Parkin extended her lead to 369 points while her compatriots, Kelly Kulick and Liz Johnson finished second and third with 344 and 295 points. 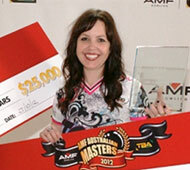 The AMF Australian Masters 2012 was the 12th and final stop of the PBA-WTBA World Bowling Tour. The World Bowling Tour is made up of various events around the world and players earn points based on how they finish in each event. The top three men and top three women are invited to compete in the World Bowling Tour Finals presented by the Professional Bowlers Association. The World Bowling Tour Finals will feature a total prize fund of $70,000. The top three men and top three women will bowl a stepladder finals format in their respective divisions. The prize money for each division is the same, with the winner taking $20,000, second place earning $10,000 and third place winning $5,000. The World Tenpin Bowling Association, which is made up of 115 bowling federations, governs the sport throughout the world. For more information on WTBA and the World Bowling Tour, visit www.worldtenpinbowling.com. Photos courtesy of Tenpin Bowling Australia Ltd.